This picture was taken at the Regional show in Österbybruk. Saponiec had very interesting bloodlines since he belonged to the racing family of *Sabellina 1954 who is his granddam. His dam *Sabrina by Aquinor was also the dam of Sekta imp Sweden, *Rubina exp US and Saladdin exp Switzerland. When she was exported she was in foal to *Figaro and gave birth to *Abrina. *Abrina stands at the Five Mile Ranch and true to her ancestors *Sabellina and Forta, she is a producer of race horses. *Sabrina was eventually bought by Tom Chauncey were she produced by both *Euros and Ben Bask. She was sold in the Tom Chauncey Arabians Select Sale in 1989. *Sabellina descendants have shown that arabians can be pretty AND useful. Several of her american offspring has been sucessful at halter but they have also been an excellent source of racing ability. Saponiec belongs to the mare family of Mlecha OA 1845, from a Kuhailan strain. This family is well represented in Sweden although the branch *Sabellina belongs to is not great in numbers. It goes back to the mare Lysa 1915 (the other branch is through Fanfara 1914) who was the dam of three mares: Mabrucha 1928 and Safta 1929, both by Pielgrzym-Thuja, and *Iwonka III 1936 by Ibn Mahomet. Safta was the dam of Sabda 1940 by Miecznik who produced Salwa 1945 imp Sweden and Sakwa 1953 (by Abu Afas and full sister to *Sabellina). In Sweden the *Sabellina blood comes through Sekta and two more recent importations. The mare Golmohar, born in Canada and imported by Blommeröd, traces back in female line to *Sabellina through her daughter *Santa (full sister to *Sambor). The other source is indirect via the male line, the stallion Samsheik at Genberg&Co is by *Sabellina's son *Sambor by Czort. Salwa 1945 has left a small family in Sweden through her daughter *Salvia but her polish offspring has certainly made a great impact. Her daughter *Szarza was the dam of Amerigo and thus paternal granddam of Khemosabi. 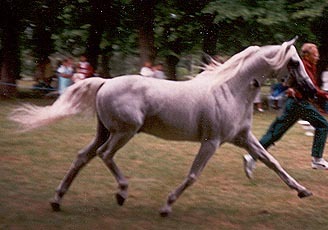 *Salina, a full sister to *Salvia, is known as a producer of race horses.